The origin of the Salt Lake City Bicycle Collective dates to a 2001 Mayor’s Bicycle Advisory Committee (MBAC) meeting, where Brenton Chu described the community bike shop concept and asked the MBAC to support him in creating one in Salt Lake City. While the concept was well received by the MBAC it was felt that they did not have the resources to support it. Brian Price, who was in attendance at that meeting, invited Brenton to meet some of his bicycle advocate friends from the Critical Mass group whom he thought might help create such an organization. These bicycle advocate friends, Edward Whitney, Jason Bultman, Jesse Ratzkin, and Jonathan Morrison started meeting weekly with Brenton and Brian to create the vision for how a service-oriented, nonprofit bicycle advocacy organization could become a reality. After months of input from the weekly meetings and research of similar organizations in other states, Brian filled out and submitted Form 1023 (Application for Recognition of Exemption Under Section 501(c)(3) of the Internal Revenue Code) in April 2002, which was approved a few months later after some minor revisions. One necessary revision was changing the name of the organization from a cooperative, as the organization did not quite meet the legal requirements of a cooperative. During a brainstorming session with the other advocates, Brian suggested calling the organization a collective, and hence, the Bicycle Collective was born as a 501(c)(3). Thanks to the initial fundraising of Edward Whitney and the continued fundraising and reporting of Jason Bultman, the Collective began to soar. The current staff of the Salt Lake City Bicycle Collective. Left to right: Jonathan Lloyd Morrison, Hailey Gilley, Stephen Rowbottom, James Kirk, Jace Burbidge. Photo: David DeAustin. The Collective’s first official activity was an Earn-A-Bike program launched at the City Center building, thanks to the support of Ken Perko and Mayor Rocky Anderson’s after-school YouthCity program. With a small shop space and an amazing group of kids, the organization’s first volunteers Jesse Ratzkin, Tim Bowman, Meara McClenehan, Keith Anderson, Jonathan Morrison, and Jason Bultman assisted each child in choosing a bike, stripping all its parts, powder coating, rebuilding it, and taking it home with a huge smile and sense of accomplishment. Still lacking many bike-specific tools and ability to order parts from distributors, they received the gracious help from Ryan Littlefield, owner of Contender Bicycles. Another early activity of the Collective was providing Valet Bicycle Parking at the Downtown Alliance’s Farmer’s Market at Pioneer Park. Brian, Edward, Jonathan and later Ron Ferrucci and Michael Wise largely headed this effort, parking dozens of patron’s bicycles while also accepting bicycle donations from the community at large. This effort created a buzz in the community and served to quickly raise visibility. The first Community Bike Shop was attempted at the Glendale Plaza, which due to its remoteness and the lack of traffic, was not viable. The current space at 2312 West Temple was offered by the late and great bicycle advocate, Bill Delvie, to the Collective after a presentation given at an Exchange Club meeting. Thanks to the Richard Hurst, Calvert Cruz, Gary Hurst, Michael McGlothlen, Steve Rowbottom, James Kirk, Jace Burbidge and too many volunteers to mention the location has continued to be improved and added to, with additional space for Salt Lake City operations under consideration. The Salt Lake City location is excited about the coming PRATT trail, the only Class 1 East -West bikeway in the valley, which will pass right by the Collective, on Haven Street in 2013.
Notable milestones for the organization include the award of a transportation enhancements and cooperative agreement with UDOT in May 2006 for a bicycle safety project, which provided the funding to hire the first full-time bicycle advocate in the state of Utah, and an IRS letter confirming our standing as a public charity in May 2007. Full time staff was added in 2006, and additional locations in 2008 (University of Utah), 2009 (Westminster College), 2010 (Ogden) and 2011 (Provo.) Today, the Bicycle Collective is directed by Jonathan Morrison with a staff of four running the programs at the Salt Lake City site. In addition to an active Board of Directors and important efforts by managers of satellite locations, the Collective has been fortunate to benefit from hundreds of volunteers, donating thousands of hours, to ensuring everyone’s access to bicycles. The tremendous support for the organization and some very scrappy talent has expanded the Collective’s reach to five locations, with its hub in Salt Lake City, at 2312 West Temple, which also houses administrative offices, a Community Bike Shop, Valet Bicycle Parking, Trips for Kids and Earn-a-Bike programs. The Ogden site, 2404 Wall St., in sight of the Front Runner station, is home to an eclectic mix of DIY projects in addition to a Community Bike Shop. Provo is the Collective’s newest location, downtown at 49 North 1100 West, in a cool historic building, with a low-key community shop vibe. The Bicycle Collective also supports Campus Bike Shops at the University of Utah and at Westminster College, where they also feature bike sharing. The Collective hopes to add future locations, potentially in Moab, St. George, or Cedar City. Over the years, the Collective has facilitated a number of one-off and annual events, including Tour de Brewtah, Bicycle Film Festivals, Bike Proms (June 2nd, our 10 year anniversary party!) and fundraisers for fallen or injured cyclists. Other community projects include working with UTA to establish the Bicycle Transit Center and UDOT on Safe Routes to Schools and the Road Respect campaigns. Given that the Bicycle Collective was the first brick and mortar bicycle advocacy organization in Utah, with their arrival pedaled in the grand expectation that they would cover all things bicycle advocacy. While they did say “yes” to just about anything at first, over time bike culture grew and new organizations like Bike Utah, Salt Cycle, and the Salt Lake City’s Mayor and City Council’s commitment to increased Bicycle and Pedestrian staff allowed the Collective to focus on their core programs. The Bicycle Collective has developed a focus on Youth Programs, Classes, Community Bike Shop and Valet Bike Parking. Their first youth program, Earn-a-Bike, was the direct result of a “yes” that Ken Perko received in 2003 when he asked if the Collective would be willing to teach an after-school class at YouthCity’s location at the Central City Recreation Center. Earn-a-Bike, loosely modeled after Bikes Not Bombs in Boston, MA, was a mechanical training course for at-risk youth, where students select a bike to keep, and spend 4-6 weeks rebuilding it from scratch. Under the supervision of role models who double as qualified mechanics, they learn to use the proper tools and techniques. Earn-A-Bike classes demystify the concept of mechanics and repair, provide an affordable means of transportation, promote a sustainable and healthy lifestyle, teach safety, instill self-confidence and pride. Thanks to the direction of Krisha Pessa, Hailey Broussard and amazing volunteers the Earn-a-Bike has been a huge success and has since been extended to other after and summer school programs such as the YWCA, Boys and Girls Clubs, and Boy Scouts of America. In 2006 Matt Peterson received a “yes” when he asked if the Collective would be willing to apply for a Trips for Kids (www.tripsforkids.org/) chapter, an introduction to mountain biking for at-risk youth program. This became their second official Youth Program. As one of many International TFK Chapters, it combines mountain bikes, fun, and the Wasatch Front to encourage lessons in confidence building, practical skills, and personal achievement. Under the guidance of Krisha Pessa, Hailey Broussard, Evan Mitchell, as well as fabulous volunteers this program has become a model program for other cities. Valet Bike Parking was a fairly new concept without a name, and in 2002 the Downtown Alliance contacted the Collective asking if they would offer monitored bike parking, at the then small, Downtown Farmers’ Market — keeping bikes safe while reducing traffic congestion and car parking. The first markets had an average 20 bikes every Saturday; now eight years later the program has grown into a valuable service used at the Twilight, Red Butte and Gallivan Concert series in addition to the Arts Festival and events at Library Square, parking over 10,000 bikes over the course of last summer. At the heart of the Collective’s mission has always been education. In 2006, Jason Bultman secured a quarter million dollars in UDOT transportation enhancements funding to run an education pilot which would certify 50 League Cycling Instructors and offer two years worth of free bicycle education classes. This grant also enabled the Collective to hire the first full-time bicycle advocate in the state of Utah. In addition to bicycle safety classes, since 2010, the Collective has offered well-attended free mechanic classes using the Park Tool School curriculum, teaching a chapter of the Park Tool’s Big Blue Book of Bicycle Repair each class. These classes have been used as a tool to train volunteers, a resource for other bike shops to train their staff, and a structured learning environment compared to self-guided Community Bike Shop hours. All of the Bicycle Collective locations feature Community/Do-It-Yourself bike shops and act as bike donation drop off locations. Bikes are primarily donated from individuals in the community, but other sources include Eagle Scout Project Bike Drives and unclaimed police evidence – thanks to the MBAC, SLCPD, SLC City Council, Mayor Ralph Becker, Sherriff Winder and Dave Iltis. Donated bikes are then refurbished by volunteers in training and then given to those in need through our ongoing Bikes for Goodwill Organizations referral program and holiday giveaways. Most of these bikes provide affordable transportation to those in need that come to us through referrals from other local non-profits, while some are sold through the community bike shop to help fund operations. In 2011, the Bicycle Collective Earn-a-Bike program distributed 250 bicycles which, combined with 750 bikes donated to charitable clients, totals over 1000 bicycles put on the street! 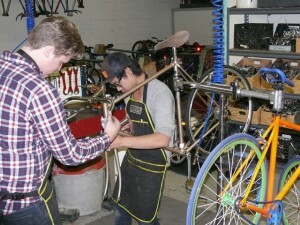 The Community Bike Shops are also a place where anyone can learn to fix their bike using the proper tools and expertise, buy used bikes and parts, or volunteer-in-trade as another way to earn a bike. Regardless of the method, since the birth of the organization, the Collective has put over 10,000 people on bikes. In 2006, the Bicycle Collective helped establish the Bicycle Collective Network (www.bikecollectives.org). “The mission of the Bike Collective Network is to strengthen and encourage communication and resource sharing between existing and future community bike shops. Collectively we can improve a bigger wheel as opposed to re-inventing smaller ones.” At that time, there were only a dozen or so organizations involved in asking and answering questions through a Wikipedia style page and an email list. Since that time, the shared information has grown and helped the establishment and growth of over 350 organizations. In addition to the community shop and youth programs featured at most bicycle collectives, some organizations engage in free helmet distribution, bicycle art, bike rack manufacturing and bicycle advocacy. This rapidly growing movement stages an annual conference, Bike!Bike! — which in 2012 will be held in Vancouver, Canada — where organizations pool strategies and methods. The Bicycle Collective’s future is very much in the hands of those who choose to become involved. You might want to join the Collective at one of the Community Bike Shops open to the general public several times a week (www.bicyclecollective.org/). As an organization looking to make a permanent difference in its communities, the Collective needs stable, affordable locations. Plans to secure a building of its own in Ogden are well under way. The Collective is building its Trips for Kids program through new partner organizations and donations of vehicles and equipment. In planning right now, The Collective is developing new educational offerings including expanded mechanic training and frame building classes. You can make these plans a reality through your donation of bikes and tools, time and money at www.bicyclecollective.org/en/donate. Many thanks go out to all the volunteers and donors over the last 10 years that have made the Collective, truly a Collective. 3 Responses to "The Bicycle Collective Celebrates 10 Years of Making Rides Happen"
And let us not forget the Women’s Shop Night that I pioneered, back when I was serving as the Volunteer Coordinator for SLCBC. It allows women of all persuasions the opportunity to teach/learn bike mechanics in a low-pressure female-friendly environment. It was great to have been a part of contributing to the success of the first 10 years of SLCBC…here’s to 10 more! Right on! Ten years…how time flies! A big thanks all around to the folks at the Collective and everyone else who acts to improve the cycling environment in SLC. Pingback: The Bicycle Collective is Searching for a new Executive Director - Ride Your Bike!